The Route will remain secret until the RoadBook is distributed. 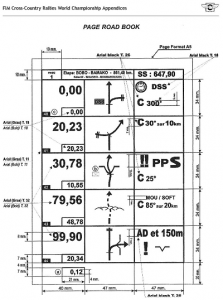 The Road Book is in standard A5 format for Cars and in 145 mm wide roll for Bikes and Quads. Both have total distance notes and relative distance notes to the next tulip. Official Road Book is in English. Minimum unit distance, is 10 meters and participants must calibrate their computer the day before the stage in a defined distance given by the organizers. It is absolutely forbidden to go in the opposite direction of the route and it is not allowed to go off the track. This incurs a penalty of 5 min. The route is divided in connection section “liaison” and timed section “selective”. In the liaison section competitors must follow the route with a defined average speed and an exact target time. 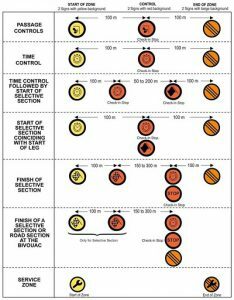 The selective section has to be covered in the fastest time possible and the sum of all special sections of all stages will define the winner. Any penalties will be added to this time. The route of the race was done by bike and distances were count by IMO 100R50 Rally, with an accuracy of 10 meters and with car equipped with Terratrip303. Bike calibration circumference: 2185. Calibration point is available in indicated waypoints provided before the race and will be also part of the 1st liaison of each leg.